Harold Jackson Pierce was born on 16 February 1929 at Texas. He was the son of William Howard Pearce and Lula Mae Foster. Harold Jackson Pierce died on 26 May 1984 at Texas at age 55. [S250] U.S. Federal Census 1930 U.S. Federal Census, by Ancestry.com, Year: 1930; Census Place: Precinct 1, Brazos, Texas; Roll: 2301; Page: 22A; Enumeration District: 0002; Image: 569.0; FHL microfilm: 2342035. [S373] U.S. Federal Census 1940 U.S. Federal Census, by Ancestry.com, Year: 1940; Census Place: McLennan, Texas; Roll: T627_4100; Page: 6B; Enumeration District: 155-45. Married Name Her married name was Barrett. Helen Ruth Pierce married Charles Ray Barrett. Helen Ruth Pierce was born on 16 February 1929 at Texas. She was the daughter of William Howard Pearce and Lula Mae Foster. Helen Ruth Pierce died on 21 November 2003 at age 74. Jack B. Culverhouse married Ethel May Pierce, daughter of William Howard Pearce and Lula Mae Foster. Jack B. Culverhouse was born in 1913. Charles Ray Barrett married Helen Ruth Pierce, daughter of William Howard Pearce and Lula Mae Foster. Charles Ray Barrett was born in 1929. Name Variation Myrtle Helen Boyer was also known as Helen Myrtle. 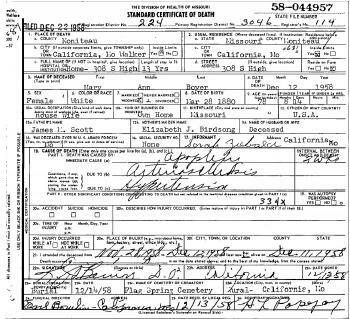 Married Name 8 April 1951 As of 8 April 1951,her married name was Coulter. Myrtle Helen Boyer was born on 5 September 1916 at Missouri. She was the daughter of Samuel Ray Boyer and Minta May Reynolds. Myrtle Helen Boyer married George Russell Coulter, son of Smith L. Coulter and Carrie B. Chambers, on 8 April 1951 at Los Angeles, California. Myrtle Helen Boyer died on 8 June 1994 at Los Angeles, California, at age 77. [S243] U.S. Federal Census 1920 U.S. Federal Census, by Ancestry.com, Year: 1920; Census Place: Lincoln, Butler, Kansas; Roll: T625_523; Page: 6A; Enumeration District: 28; Image: 1065. [S250] U.S. Federal Census 1930 U.S. Federal Census, by Ancestry.com, Year: 1930; Census Place: El Dorado, Butler, Kansas; Roll: 695; Page: 13B; Enumeration District: 0021; Image: 458.0; FHL microfilm: 2340430. [S373] U.S. Federal Census 1940 U.S. Federal Census, by Ancestry.com, Year: 1940; Census Place: El Dorado, Butler, Kansas; Roll: T627_1222; Page: 16B; Enumeration District: 8-19. George Russell Coulter was born on 25 November 1901 at Barry, Michigan. He was the son of Smith L. Coulter and Carrie B. Chambers. George Russell Coulter married Myrtle Helen Boyer, daughter of Samuel Ray Boyer and Minta May Reynolds, on 8 April 1951 at Los Angeles, California. George Russell Coulter died on 7 September 1975 at Los Angeles, California, at age 73. Name Variation Samuel Ray Boyer was also known as Samuel Roy. Name Variation Samuel Ray Boyer was also known as Ray. Name Variation Samuel Ray Boyer was also known as Roy Samuel. Samuel Ray Boyer was born in August 1888 at Missouri. He was the son of William Virgil Boyer and Mary M. Adair. Samuel Ray Boyer married Minta May Reynolds, daughter of William F. Reynolds and Sarah F. Martin, in 1914. 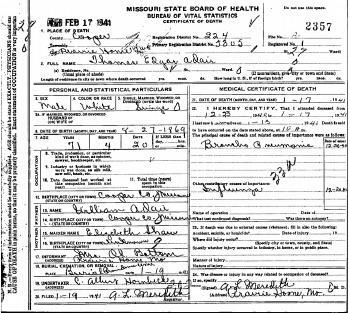 Samuel Ray Boyer witnessed the death of Myrtle M. Boyer on 27 November 1940 at Jefferson City, Cole, Missouri; Death record of Myrtle (Boyer) Volkart. Samuel Ray Boyer died on 23 October 1948 at Los Angeles, California, at age 60. Samuel Ray Boyer and Charles Francis Boyer worked in the oil fields of Kansas. [S245] U.S. Federal Census 1900 U.S. Federal Census, by Ancestry.com, Year: 1900; Census Place: Jefferson, Johnson, Missouri; Roll: 868; Page: 6A; Enumeration District: 0109; FHL microfilm: 1240868. [S244] U.S. Federal Census 1910 U.S. Federal Census, by Ancestry.com, Year: 1910; Census Place: Pilot Grove, Moniteau, Missouri; Roll: T624_800; Page: 6B; Enumeration District: 0097; FHL microfilm: 1374813. Name Variation Minta May Reynolds was also known as May Minta. Name Variation Minta May Reynolds was also known as Mary. Name Variation Minta May Reynolds was also known as Minta Mae. Married Name 1914 As of 1914,her married name was Boyer. Minta May Reynolds was born on 10 February 1893 at Lamine, Cooper, Missouri. She was the daughter of William F. Reynolds and Sarah F. Martin. Minta May Reynolds married Samuel Ray Boyer, son of William Virgil Boyer and Mary M. Adair, in 1914. Minta May Reynolds died on 22 November 1981 at Los Angeles, California, at age 88. Married Name Her married name was Murray. Juanita R. Boyer married (?) Murray. Juanita R. Boyer was born on 6 July 1915 at Missouri. Juanita R. Boyer died on 16 May 1982 at Los Angeles, California, at age 66. Roy Edgar Boyer married Nellora M. Corn. Roy Edgar Boyer was born on 13 October 1918 at Oklahoma. 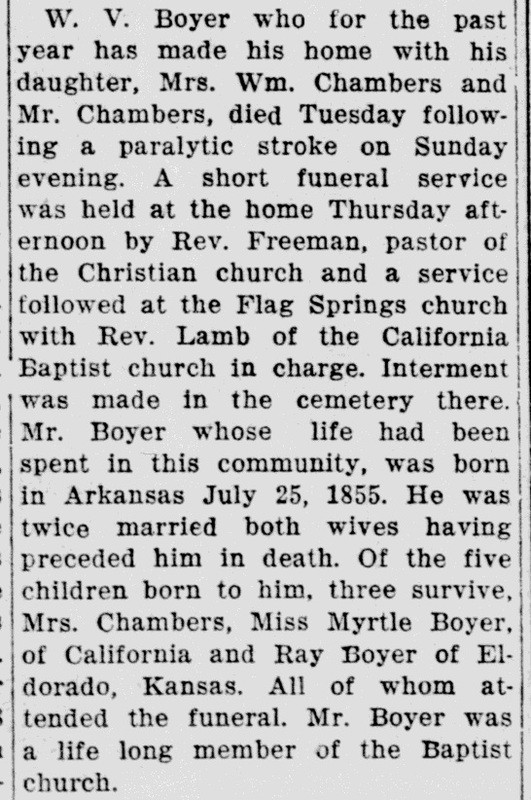 He was the son of Samuel Ray Boyer and Minta May Reynolds. Roy Edgar Boyer died on 20 September 1966 at age 47. Married Name 20 December 1885 As of 20 December 1885,her married name was Boyer. Mary M. Adair was born on 11 November 1854 at Missouri also reported as Nov 1853. She was the daughter of William Adair and Elizabeth Shaw. 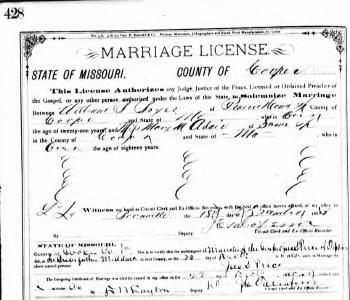 Mary M. Adair married William Virgil Boyer, son of Samuel Boyer and Margaret Kelley, on 20 December 1885 at Cooper, Missouri. Mary M. Adair died on 15 May 1908 at age 53 also reported as May 15, 1902. [S248] U.S. Federal Census 1860 U.S. Federal Census, by Ancestry.com, Year: 1860; Census Place: Saline, Cooper, Missouri; Roll: M653_616; Page: 646; Family History Library Film: 803616. [S246] U.S. Federal Census 1880 U.S. Federal Census, by Ancestry.com, Year: 1880; Census Place: Prairie Home, Cooper, Missouri; Roll: 683; Family History Film: 1254683; Page: 396B; Enumeration District: 143; Image: 0436. Name Variation William Virgil Boyer was also known as W. V.
William Virgil Boyer was born on 25 July 1855 at Tennessee also reported as Jul 1856; also reported as Arkansas and Missouri. He was the son of Samuel Boyer and Margaret Kelley. 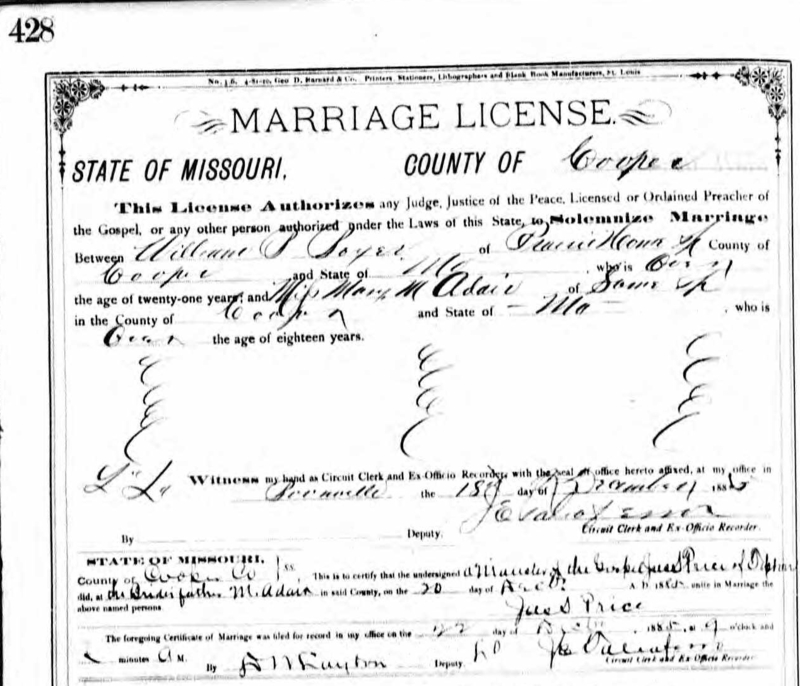 William Virgil Boyer married Mary M. Adair, daughter of William Adair and Elizabeth Shaw, on 20 December 1885 at Cooper, Missouri. William Virgil Boyer married Susan Ogden in 1910. William Virgil Boyer died on 16 October 1928 at Moniteau, Missouri, at age 73 obituary and death certificate of William Virgil Boyer. [S247] U.S. Federal Census 1870 U.S. Federal Census, by Ancestry.com, Year: 1870; Census Place: Lebanon, Cooper, Missouri; Roll: M593_772; Page: 467B; Family History Library Film: 552271. 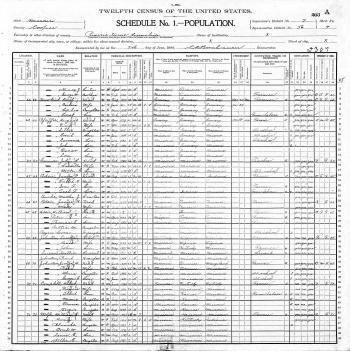 [S243] U.S. Federal Census 1920 U.S. Federal Census, by Ancestry.com, Year: 1920; Census Place: Parkman, Ellis, Oklahoma; Roll: T625_1463; Page: 3B; Enumeration District: 61; Image: 214. Samuel Boyer was born in 1833 at Tennessee also reported as Kentucky; parents born in Pennsylvania. He was the son of Henry Boyer and Mary Gambell. Samuel Boyer married Margaret Kelley before 1855. Samuel Boyer married Louisa Krause on 18 April 1861 at 2nd marriage for him, Bethel, Shelby, Missouri, his surname listed as Bauer. Samuel Boyer married Hannah Louisa Ivy, daughter of Anslem Ramsey Ivy and Susannah Anbell Moon, in 1870 at 3rd marriage for him. In July 1863 at Civil War Draft Registration, Jasper, Missouri. [S247] U.S. Federal Census 1870 U.S. Federal Census, by Ancestry.com, Year: 1870; Census Place: Bethel, Shelby, Missouri; Roll: M593_806; Page: 3B; Image: 225804; Family History Library Film: 552305. [S246] U.S. Federal Census 1880 U.S. Federal Census, by Ancestry.com, Year: 1880; Census Place: Mill Creek, Morgan, Missouri; Roll: 705; Family History Film: 1254705; Page: 211A; Enumeration District: 192; Image: 0425. Name Variation Margaret Kelley was also known as Kelly. Married Name before 1855 As of before 1855,her married name was Boyer. Margaret Kelley married Samuel Boyer, son of Henry Boyer and Mary Gambell, before 1855. Margaret Kelley died circa 1860. Name Variation Charles Francis Boyer was also known as C. F.
Name Variation Charles Francis Boyer was also known as Charlie. Charles Francis Boyer was born on 12 October 1886 at Cooper, Missouri, also reported as 12 Oct 1887. Charles Francis Boyer married Mary Ann Scott in 1909. 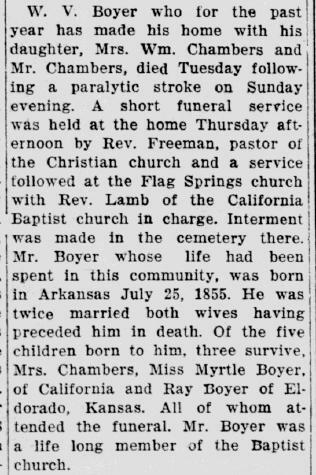 Charles Francis Boyer died on 7 September 1927 at Walker, Moniteau, Missouri, at age 40 death certificate - died from acute appendicitis; Ben Burrell attended funeral of brother-in-law Charles Boyer. Charles Francis Boyer and Samuel Ray Boyer worked in the oil fields of Kansas. Charles was a night marshall and he worked in the oil fields in KS. He moved back to the California, MO, area after his daughter drowned. [S244] U.S. Federal Census 1910 U.S. Federal Census, by Ancestry.com, Year: 1910; Census Place: Pilot Grove, Moniteau, Missouri; Roll: T624_800; Page: 1A; Enumeration District: 0097; FHL microfilm: 1374813. [S243] U.S. Federal Census 1920 U.S. Federal Census, by Ancestry.com, Year: 1920; Census Place: California Ward 3, Moniteau, Missouri; Roll: T625_935; Page: 3A; Enumeration District: 116; Image: 825. Married Name 1909 As of 1909,her married name was Boyer. Mary Ann Scott was born on 28 March 1880 at Missouri. She married Charles Francis Boyer, son of William Virgil Boyer and Mary M. Adair, in 1909. 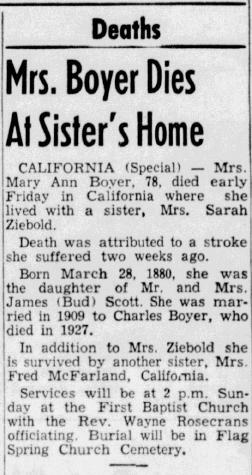 Mary Ann Scott died on 12 December 1958 at California, Moniteau, Missouri, at age 78 Mary Ann (Scott) Boyer obituary and death certificate. Name Variation Myrtle M. Boyer was also known as Mertie. Married Name before 1912 As of before 1912,her married name was Wisdom. Married Name 26 April 1929 As of 26 April 1929,her married name was Volkart. Myrtle M. Boyer was born on 10 February 1889 at Cooper, Missouri, also reported as 10 Feb 1890. She was the daughter of William Virgil Boyer and Mary M. Adair. 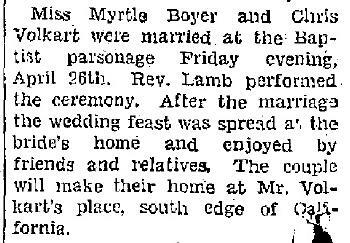 Myrtle M. Boyer married Harvey Longly Wisdom before 1912. 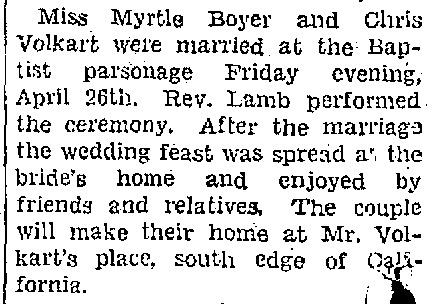 Myrtle M. Boyer and Harvey Longly Wisdom were divorced before 1921. Myrtle M. Boyer married Christopher Gotlieb Volkart on 26 April 1929 Myrtle Boyer and Chris Volkart wedding announcement. Myrtle M. Boyer and Christopher Gotlieb Volkart were divorced circa 1934. 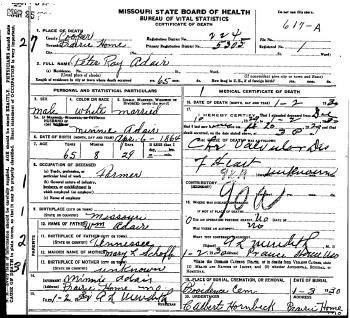 Myrtle M. Boyer died on 27 November 1940 at Jefferson City, Cole, Missouri, at age 51 Death record of Myrtle (Boyer) Volkart. [S250] U.S. Federal Census 1930 U.S. Federal Census, by Ancestry.com, Year: 1930; Census Place: California, Moniteau, Missouri; Roll: 1213; Page: 1B; Enumeration District: 0011; Image: 126.0; FHL microfilm: 2340948. [S373] U.S. Federal Census 1940 U.S. Federal Census, by Ancestry.com, Year: 1940; Census Place: Pilot Grove, Moniteau, Missouri; Roll: T627_2130; Page: 5A; Enumeration District: 68-11. Name Variation Christopher Gotlieb Volkart was also known as Chris. Christopher Gotlieb Volkart was born on 2 April 1897 at California, Missouri. He married Adelaide L. Brady circa 1919. Christopher Gotlieb Volkart married Myrtle M. Boyer, daughter of William Virgil Boyer and Mary M. Adair, on 26 April 1929 Myrtle Boyer and Chris Volkart wedding announcement. Christopher Gotlieb Volkart and Myrtle M. Boyer were divorced circa 1934. Christopher Gotlieb Volkart married Minnie Mae Duvall on 24 June 1941. Christopher Gotlieb Volkart died in March 1958 at age 60 Christopher G Volkart obituary. 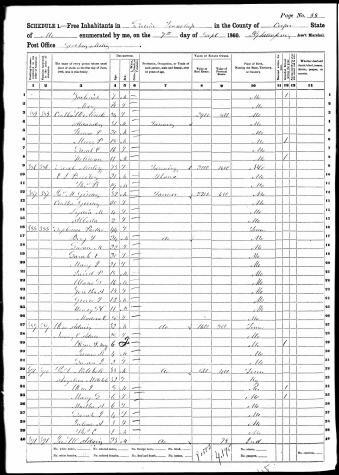 [S373] U.S. Federal Census 1940 U.S. Federal Census, by Ancestry.com, Year: 1940; Census Place: California, Moniteau, Missouri; Roll: T627_2130; Page: 28B; Enumeration District: 68-12. Name Variation Mary Elizabeth Boyer was also known as Molly. Name Variation Mary Elizabeth Boyer was also known as Mollie. Married Name 15 June 1918 As of 15 June 1918,her married name was Burrell. Mary Elizabeth Boyer was born on 19 October 1894 at Cooper, Missouri. 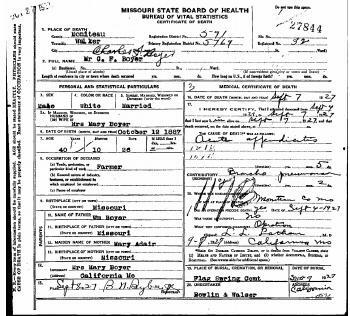 Mary Elizabeth Boyer married Benjamin Edmund Burrell, son of Allen C. Burrell and Louisa Sarah Cary, on 15 June 1918 at Cooper, Missouri. Mary Elizabeth Boyer died on 25 July 1926 at Kansas at age 31. 1925 Clifford, Butler, Kansas Mary Elizabeth Boyer appeared on the census of 1925 in the household of Benjamin Edmund Burrell at Clifford, Butler, Kansas; no children listed. [S243] U.S. Federal Census 1920 U.S. Federal Census, by Ancestry.com, Year: 1920; Census Place: Clark Fork, Cooper, Missouri; Roll: T625_914; Page: 6B; Enumeration District: 74; Image: 704. Name Variation Benjamin Edmund Burrell was also known as Ben Edmond. Benjamin Edmund Burrell was born on 10 December 1892 at Missouri. He was the son of Allen C. Burrell and Louisa Sarah Cary. 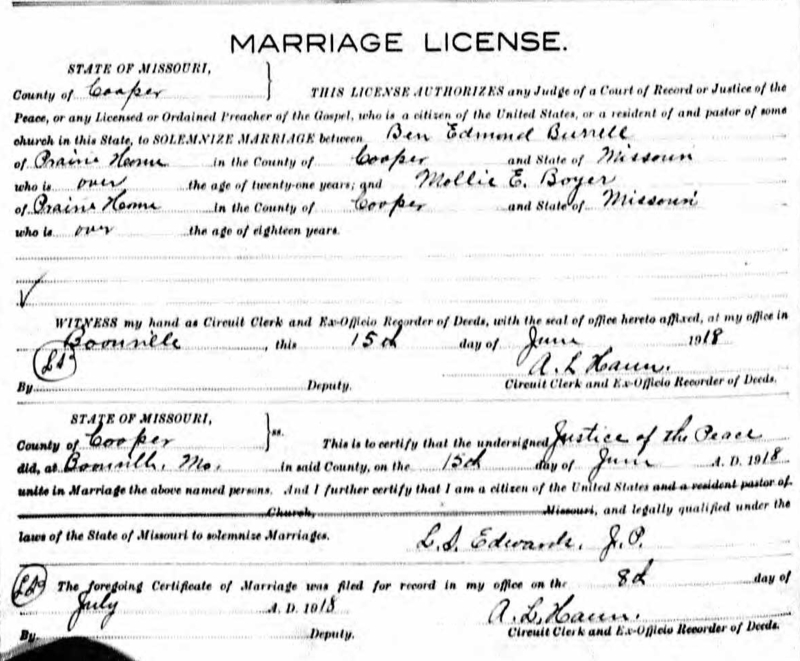 Benjamin Edmund Burrell married Mary Elizabeth Boyer, daughter of William Virgil Boyer and Mary M. Adair, on 15 June 1918 at Cooper, Missouri. Benjamin Edmund Burrell married Leona M. (?) after 1926. Benjamin Edmund Burrell died on 9 February 1942 at age 49. 1925 Clifford, Butler, Kansas He appeared on the census of 1925 at Clifford, Butler, Kansas, no children listed. Benjamin Edmund Burrell was a oil worker in 1925. [S373] U.S. Federal Census 1940 U.S. Federal Census, by Ancestry.com, Year: 1940; Census Place: Walnut, Butler, Kansas; Roll: T627_1222; Page: 2B; Enumeration District: 8-49. Married Name 18 April 1861 As of 18 April 1861,her married name was Boyer. Louisa Krause was born in 1832 at Missouri. She married Samuel Boyer, son of Henry Boyer and Mary Gambell, on 18 April 1861 at 2nd marriage for him, Bethel, Shelby, Missouri, his surname listed as Bauer. Ruth Irean Boyer was born on 12 February 1910 at Moniteau, Missouri. She was the daughter of Charles Francis Boyer and Mary Ann Scott. Ruth Irean Boyer died on 14 November 1925 at Moniteau, Missouri, at age 15 drowned in Fox Lake, Cassoday, KS (near El Dorado). Name Variation Susan Ogden was also known as Austin. Name Variation Susan Ogden was also known as Susie. Married Name 1910 As of 1910,her married name was Boyer. Susan Ogden was born in 1867 at Missouri. She married William Virgil Boyer, son of Samuel Boyer and Margaret Kelley, in 1910. Susan Ogden died in 1923. Married Name Her married name was Boyer. 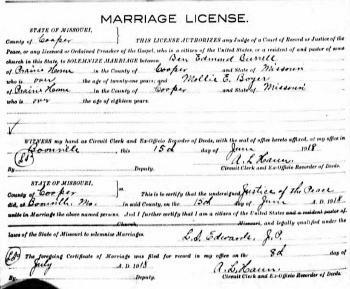 Nellora M. Corn married Roy Edgar Boyer, son of Samuel Ray Boyer and Minta May Reynolds. Nellora M. Corn was born on 13 December 1921. She died on 30 March 2002 at age 80. Sharon Kay Boyer was never married. She was born on 27 September 1947 at Kansas. She was the daughter of Roy Edgar Boyer and Nellora M. Corn. Sharon Kay Boyer died on 18 November 2008 at Indiana at age 61. (?) Murray married Juanita R. Boyer, daughter of Samuel Ray Boyer and Minta May Reynolds. William Adair was born on 19 September 1827 at Tennessee. He was the son of Stephen Adair and Mary Adaline Carter. William Adair married Elizabeth Shaw circa 1852. William Adair died on 19 October 1908 at Cooper, Missouri, at age 81. He was buried after 19 October 1908 at New Salem Cemetery, Prairie Home, Cooper, Missouri. [S245] U.S. Federal Census 1900 U.S. Federal Census, by Ancestry.com, Year: 1900; Census Place: Prairie Home, Cooper, Missouri; Roll: 850; Page: 4A; Enumeration District: 0056; FHL microfilm: 1240850. Name Variation Elizabeth Shaw was also known as Matilda Elizabeth. Name Variation Elizabeth Shaw was also known as Nancy Elizabeth. Married Name circa 1852 As of circa 1852,her married name was Adair. Elizabeth Shaw was born on 20 August 1831 at Cedar, Missouri. She married William Adair, son of Stephen Adair and Mary Adaline Carter, circa 1852. Elizabeth Shaw died on 4 September 1889 at Missouri at age 58. She was buried after 4 September 1889 at New Salem Cemetery, Prairie Home, Cooper, Missouri. [S249] U.S. Federal Census 1850 U.S. Federal Census, by Ancestry.com, Year: 1850; Census Place: Cedar District, Cedar, Missouri; Roll: M432_395; Page: 136B; Image: 278. Name Variation Peter Ray Adair was also known as P. R.
Peter Ray Adair was born on 6 April 1864 at Missouri. He was the son of William Adair and Elizabeth Shaw. Peter Ray Adair married Minnie Rethemeyer circa 1905. 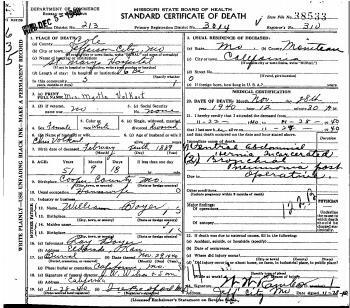 Peter Ray Adair died on 2 January 1930 at Cooper, Missouri, at age 65 death certificate lists mother as Mary L Schoff; Death certificate of Peter Ray Adair. [S244] U.S. Federal Census 1910 U.S. Federal Census, by Ancestry.com, Year: 1910; Census Place: Walker, Moniteau, Missouri; Roll: T624_800; Page: 8B; Enumeration District: 0099; FHL microfilm: 1374813. Name Variation Thomas Edgar Adair was also known as Edward Thomas. Name Variation Thomas Edgar Adair was also known as T. E.
Thomas Edgar Adair was never married. He was born on 27 August 1869 at Cooper, Missouri, also reported as Aug 1870. 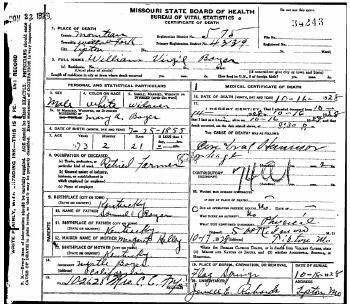 Thomas Edgar Adair died on 17 January 1941 at Cooper, Missouri, at age 71 Death certificate of Thomas Edgar Adair. [S244] U.S. Federal Census 1910 U.S. Federal Census, by Ancestry.com, Year: 1910; Census Place: Prairie Home, Cooper, Missouri; Roll: T624_773; Page: 5A; Enumeration District: 0076; FHL microfilm: 1374786. [S243] U.S. Federal Census 1920 U.S. Federal Census, by Ancestry.com, Year: 1920; Census Place: Prairie Home, Cooper, Missouri; Roll: T625_914; Page: 8B; Enumeration District: 87. [S250] U.S. Federal Census 1930 U.S. Federal Census, by Ancestry.com, Year: 1930; Census Place: Prairie Home, Cooper, Missouri; Page: 3B; Enumeration District: 0023. [S373] U.S. Federal Census 1940 U.S. Federal Census, by Ancestry.com, Year: 1940; Census Place: Prairie Home, Cooper, Missouri; Roll: m-t0627-02100; Page: 5B; Enumeration District: 27-24.